You are here: Home / EU - Regulating Biking / Moving the Goal Posts! On Friday, 16th September, the Motorcycle Working Group met again to discuss the issues surrounding the proposals for a regulation of 2 and 3 wheeled vehicles and market surveillance. The Transport Research laboratory (TRL) presented their findings on Durability of pollution control measures, Light duty electric and hybrid vehicles – and they presented their findings regarding Tampering prevention. 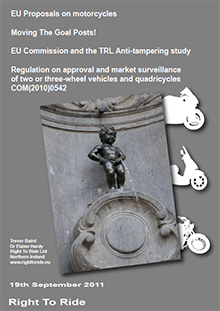 In April this year, Right To Ride reported on the fact that the Commission had contracted the British research institute TRL to initiate a so called anti-tampering study on their behalf. As the name suggests, the study investigates the existing forms of ‘harmful power-train tampering’ as well as measures to prevent them. Was the TRL Study a Success? According to TRL, the response to the competition was insufficient and it was cancelled because there were “Not enough valid entries to run the competition”. So they failed to fulfil that part of their contract with the Commission. “A second source of input will come from the type-approval and enforcement authorities via such a questionnaire”. However in the TRL presentation at the MCWG meeting, there is no mention of how many replied (although a questionnaire was sent to over 400 stakeholders). We can only presume that this second goal was unsuccessful, simply because they do not mention the feedback and/or any results. Draft selections made on tampering types to inform testing, but still ongoing and iterative process… (which in layman’s terms means that they will keep going until they get the answers that they want – which is to identify harmful tampering and apply anti-tampering measures – even if it is a complete waste of time and money). So the answer appears to be that the TRL study was not a success. More to the point – is harmful tampering widespread and is it a problem in terms of safety and the environment? It does seem that whatever facts are presented, the Commission just keeps moving the goal posts. What is really worrying is that with few exceptions, the MEPs in their fervour to save lives and reduce emissions, have given the Commission Carte Blanche to cripple an industry and ratchet up the cost of two wheeled transport and leisure, thus creating further hardship and potentially driving up unemployment as companies struggle to implement the proposed regulations. We have to agree with ACEM – at the MCWG meeting on Friday, their representative told the Commission and members with regards to the timetable for implementing the proposed regulations that the revised Commission proposal was “a Nightmare Scenario” and commented that the Commission was “changing the rules in the middle of the game”. At Right To Ride, our view is that not only have they changed the rules in the middle of the game, but they have also moved the goal posts! We can’t help but think that the famous statue in Brussels has taken on a whole new meaning. Thank you for your comment. A bit of background about Trevor and myself. We both worked in Brussels for FEMA. Trevor as the Technical Officer representing FEMA and the International Coalition in the UNECE in Geneva and myself as Research Officer involved in various EU projects. We have a very good understanding of how things work in Brussels which is why we left and returned to Northern Ireland. If there were a referendum to withdraw from the European Union, I would certainly vote in favour. I am aware that there are corrupt people within the European Union. However, the point that must be made in this case is simple. 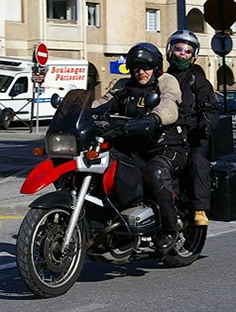 The European Commission has put forward proposals relating to technical issues which is related to 2 and 3 wheeled vehicles and market surveillance and while it is tempting to include the problems that French motorcyclists are facing and issues in the Republic of Ireland (Hi Viz), these entirely separate. If we want to contest the EU Commission’s proposals then we need to concentrate on those issues otherwise they will ignore us because Hi Viz is not part of their proposals. In Northern Ireland we work closely with the local government on road safety issues and have made a lot of inroads by talking to them and we know they listen. As and when there is a proposal by the European Commission to introduce Hi Viz clothing (or banning vehicles over seven years old from city centres), we will be the first to make our views known – that we do not agree and will – as we are doing now with regards to the present proposals, write to them and lobby against any such proposal. I understand that Spain has introduced a number of draconian measures against motorcyclists and we are very sympathetic with what is happening there. Anyway, thank you for your comments, which are very much appreciated. But this is more than just politicians and while the French done a great job with their protests on their own internal matters but we can see no mention of this proposed EU Legislation. If you are saying that politiians will use every trick in the book to get what they want, then those that have concerns about the EU proposals will use their portfolio to their and our advantage. I suppose it’s a – is the glass half full or half empty moment! We have only to look at the way Westminster council behaved to realise that politiians are not to be trusted, they will use every trick in the book to get what they want. I am a retired Policeman, and Police motorcyclist. 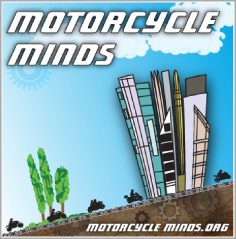 A member of the Blue Knights MC, and several other motor cycle clubs, and I have been riding for over 40 years, and almost every motorcycle I have owned, has been modified in some way. I live in Spain, and I ride a BMW R1100GS. (Modified) I am totally against the anti tampering laws on principal. We have more than enough ‘big brother laws’, both in the UK and the EU, and like most people, I have had enough of domestic and foreign interference with basic freedoms of the individual. I write this more as a warning of what is to come, rather than just a protest. We, as motorcyclists, whether individuals, club members, or any other group, are NOT dealing with a democratic organisation, when it comes to the EEC. Some of us have voted for MEP’s, but once in the EU parliament, we have absolutely no control whatsoever, and no influence on the decisions made on our behalf. If past EU legislation is studied, it will be found that no matter what the recommendations by proffessional bodies, or groups such as the farmers, the EU will make the decisions that they want to suit their agenda, and their agenda is total uniformity across all member states, in all things. Living in Spain, i can give you first hand experience of anti tampering. The first experience was importing a Harley Davidson softail custom into Spain. I had fitted a Harley 19″ front wheel in place of the 21″ wheel to improve the handling, and larger mirrors. When it came to the ITV (MOT), it was failed for having a non standard wheel, and being too wide, because the mirrors extended out further than standard. The S&S carb, drilled out mufflers, and gas shocks were not noticed ! This was after spending almost a hundred euros, on a compulsory, detailed engineers study of the machine. If you want to modify any vehicle, you must only fit EU approved, AND Spanish, and EU, homologated parts. These must be accompanied by the relevant certification. But wait, that’s not all. These parts must then be fitted by a qualified vehicle technician, who then has to supply further certification, showing that he is qualified. So to recap, you have to pay inflated prices for the homologated parts, and the certificates. Then pay to have them fitted by an engineer, and for his certification. You then have to pay to re MOT the machine, and have the parts added to the technical part of your registration document. In addition you have to do this every time the machine is modified. The proverbial cash cow ! Of course, if you have everything done at once, you only have to do this once !!! Another example is tow bars for a car, 4×4 etc. The parts must be homologated, fitted by a certifcated engineer, and the vehicle inspected at an MOT station. There are some highly modified 4×4’s here, that are actualy used off road ! Their technical registration document run into pages, and it has to be remembered that, it is law, that you must carry all the original documents for the machine with you. Both registration documents, (One for ownership and one technical) MOT, Insurance and proof that you have paid next years road tax. Also your driving licence of course. Most dealers carry stocks of parts to enable machines to pass the MOT, after which everybody re fits the non standard parts, but this leaves you open to prosecution, and you have to pay the dealer to MOT the machine for you. This is causing huge problems in Barcelona, where up to 400 harleys, are in danger of being confiscated, and or the owners fined, because their machines come nowhere near the Spainish MOT requirements. I know of one dealer who imports Harleys, and other custom machines by the container load, and more than half are not standard. they all pass the MOT when they are sold, and I can honestly say, that he would never let an unsafe machine out of his premises. However, even though this dealer may not be involved, the process is simple. Most, but NOT all MOT stations are government owned and run. However, because of the volume of machines, some have been turning a blind eye, as long as the machine is safe, because of the revenue invloved. The Guardia Civil, are being blamed for the crack down, but of course it is in fact the government, who have ordered the action to start with. The situation is similar to the illegal housing farce in Spain. The owner gets prosecuted, and his vehicle confiscated, and legal proceedings are instigated. This will take a minimum of 2 years, during which time the vehicle will be stored, as is, in an open, fenced pound. Or a shed if you’re lucky. Sometimes for 4 years or more. If you win, the vehicle will be returned to you with no right of compensation ! NONE ! If you lose, the vehicle will be sold for it’s current value to pay the fine, or returned to you after paying the fine. Then of course you have to return, what is likely to be a pile of scrap, to manufacturers spec, and then go through the whole process of homologation, engineers and MOT, to put the machine back on the road. The dealer will by then have gone bankrupt, and re-opened in his wifes name, so no hope there then. The cash cow, has now become a cash herd ! To make matters worse, the Spanish have a nasty habit of crushing illegal vehicles anyway. The whole point of the proposed legislation, is that we will be compelled to ride standard, or modified EU approved machines, wearing high visibility flourescent clothing. To do so, we will have to pass ever more stringent tests, with the final result being that nobody will want to ride motorcyles, which is precisely the aim of the EU transport policies that we do not see. FACT. The EU parliament have railroaded legislation through parliament many times, despite protest and lobbying. The ever more complex reports, and studies, are simply a smoke screen to keep us busy and complacent, and we will almost certainly find much of the legislation goes through, before we are even aware of it, and with studies etc, still gong through the motions. Should we then continue to protest ? SUPPORT THE RIGHT TO RIDE WITH ALL THE MEANS AT YOUR DISPOSAL.